This graph shows the change of teenage marijuana use in U.S. states with medical marijuana laws according to surveys between 1995 and 2015. It was found that in 13 states with medical marijuana laws there were overall decreases in teenage marijuana use. There were five states that reported higher teenage marijuana use after medical marijuana laws were passed, but none of these were statistically significant changes. 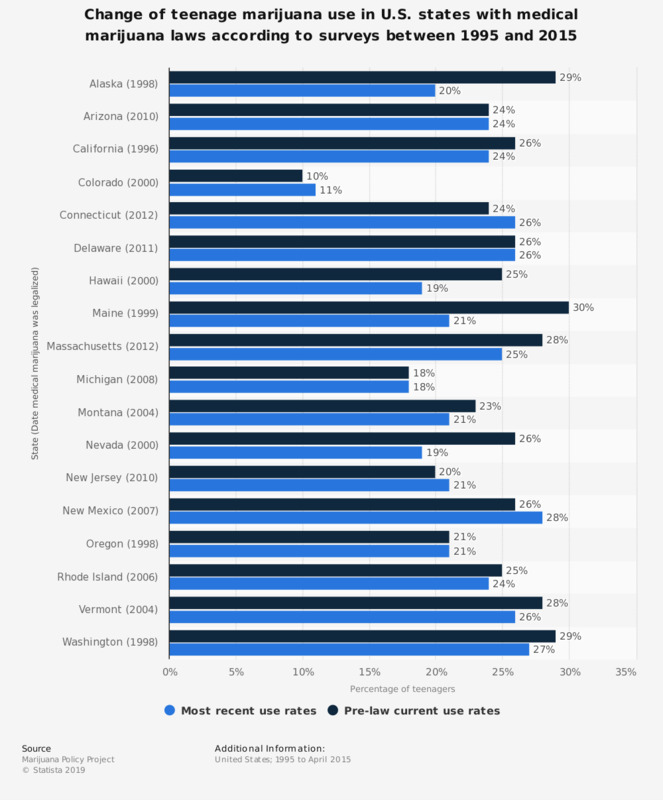 Pre-law current use rate dates range from 1995 to 2011. Most recent use rate dates range from 2011 to 2013. There is no "after" data available for New Hampshire, Illinois, Maryland, Minnesota, or New York, as the laws in these states are too new. "Current use" refers to the past 30 days. "Teenage" refers to high school students. How safe or dangerous is it for a person to use tobacco?